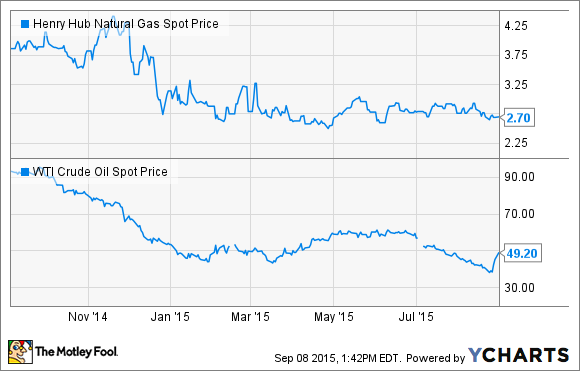 Why in the World Is Chesapeake Energy Corporation Still Trying to Grow? Chesapeake Energy Corporation is accelerating production growth despite an oversupplied market. When Chesapeake Energy Corporation (NYSE:CHK) reported its second-quarter results it surprised investors by boosting its production growth guidance. Instead of just trying to be conservative and keep its adjusted production flat given the current market oversupply, Chesapeake Energy has decided to actually accelerate its production growth. It's a bold move for the company, but not the one many investors and analysts would rather see as most would like to see the company simply leave that oil and gas underground until prices improve and instead reduce its capital expenditures so it can reduce debt. Chesapeake Energy started the year with a capex budget in the range of $4-$4.5 billion, which was roughly 26% lower than what it spent the prior year. This spending was expected to drive adjusted production growth of 3%-5% over the prior year. However, just a month after announcing that budget the company cut $500 million from it due to the continued weakness in commodity prices. That reduction was expected to have a noticeable impact on production growth, bringing it down to just 1%-3% ahead of 2014 production. However, as a result of some rather significant reductions in its costs, Chesapeake Energy is now in the position to deliver more production growth without spending any more than it had previously planned. The net result is that its adjusted full-year production growth rate is expected to be 4% higher at the midpoint of its prior 1%-3% projected growth rate. The problem investors have with this is the fact that Chesapeake is accelerating production growth when commodity prices are not improving and are actually weaker than before. This has some investors wondering why the company isn't cutting capex so that production will stay roughly flat and using that cash to further reduce debt on its balance sheet. This really has to do with the fact that its costs have come down so dramatically and its well performance has improved so stunningly that the company is earning the same, if not better, returns now than when commodity prices were higher. That's evident on the following chart that shows the company's returns in its northern Marcellus area. As that slide notes, the company's well cost has dropped from $9 million to $7 million despite the fact that it is drilling a longer lateral well length and fracking more stages per well. These changes, however, are vastly improving the initial production rate and estimated ultimate recovery rate of each well. That combination of lower costs on a much more productive well has cut its breakeven rate of return in half since 2011. The reason Chesapeake Energy is still growing production into an oversaturated market is because it is still being compensated generously to do so as the drilling returns are as good, if not better, than before. The company's hope, therefore, is that it can create more value for investors by growing volume than by waiting for prices to recover. It's certainly a gutsy move, to say the least. However, it won't pay off if Chesapeake and its peers keep pushing out more production into a natural gas market that is saturated to the brim, because at some point prices could collapse so that the drilling returns are no longer quite so compelling. A much better solution would be to just keep that incremental gas in the ground until it's needed and use the cash to increase its financial flexibility so that it is in a position to ramp up production should prices improve. Chesapeake just doesn't seem to be learning from its past missteps that growth doesn't pay unless that growth is during a strong market, which clearly isn't the case today.